Dr. Sami R. AlAraji, Chairman of the National Investment Commission opened the forum with a welcoming speech to the attendees including the Iraqi Minister of Trade, French State Minister for the Foreign Trade Affaires, the Iraqi Governor of the Central Bank and a number of governors, Vice Ministers, Consultants, Director Generals, Heads of Provinces’ Councils, Chairmen of Commercial Chambers and Unions, Companies owners and Businessmen. having the French TALS Co. for fund Insurance and protection for the French companies working in Iraq as France has landed Iraq $450b aiming at supporting the Iraqi- French relations specially after the Iraqi Prime Minister visit to Paris last October. He ended his speech by referring to the importance of mutual trust bursting from real political desire of the two leaders to move ahead with the two countries relation and find mutual responsibility and in common interests. Mr. Raghib R. Blaibil, head of The Iraqi- French Council of Businessmen, considered this forum is a precious opportunity for Iraqi and French businessmen to meet and discuss the fruitful business potential for both sides. He also mentioned the improvement in the economic situation after defeating ISIS in Iraq and the victory our security forces achieved on the ground. The will for reconstructing, bringing the displaced back to their homes and the elevated oil price are strong factors encouraging us to invite the French companies to work and invest all over Iraq strongly and freely with no hesitation or fear. Paris after the Iraq opened its airs to the international civil aviation. The Iraqi- French Council of Businessmen representative Mr. Arnold Brolack inquired about sectors Iraq is willing to invest with the French side and what Iraqi aid is available to achieve tangible results after unifying the two parties’ views. Mr. Ali Al Alaq, Governor of the Central Bank, long speech emphasized on the successful financial policies of the Central Bank of Iraq during the past years. These policies, in cooperation with the Ministry of Finance, saved Iraq from the sudden oil price drop shock and unstable economic situation. Dr. Mahir Hamad, Vice Minister of Finance, and Mr. Faisal Al Haimis, Director General of the Trade Bank of Iraq gave their speeches too. Dr. Sami R. Al Araji ended the first session works with a detailed presentation of strategic opportunities available for investment in Iraq. The second session started later where bilateral discussions between the Iraqi and the French parties in different economic sectors took place. French Alstom Transport Co. signed two memoranda of understanding with local governments in Baghdad and Basra provinces to build modern metro with international specifications. Determine the required share of the participating company from the production. 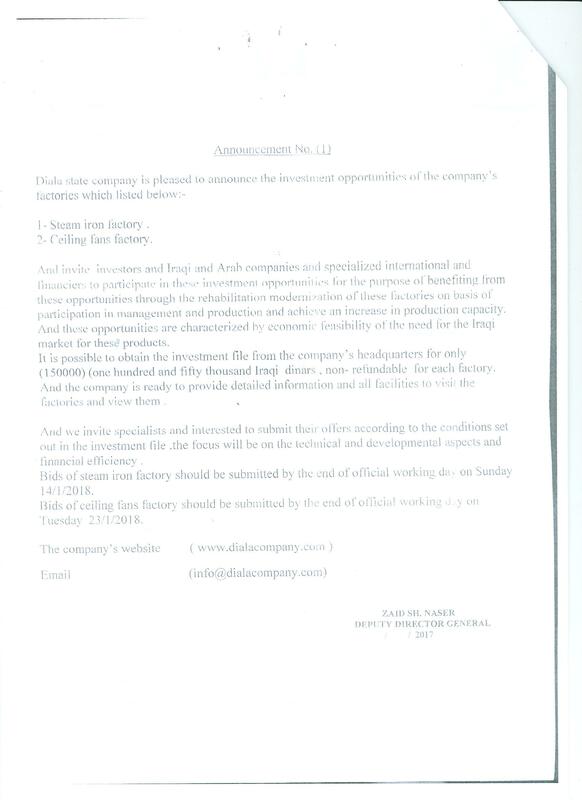 The certificate of registration of the participating company (colored copy) certified by the concerned authorities of the national companies valid for the current year, and for the Arab and foreign companies are certified by the Iraqi Embassy in the country of origin and be valid for the current year . The financial position document of the company and its financial efficiency supported by the international banks attached to the final accounts for the last three years and approved by the office of certified auditing. Clearance from the general authority for taxes for the current year for national companies and Arab and foreign companies that have a branch or agent or office inside Iraq. The offer shall be accompanied by bid bond guarantee in the amount of (1%) from the estimated cost amount of 37.5 million $ under a certified check or letter of guarantee issued by an accredited bank to ensure the seriousness of participation in the advertisement. The awarded company shall bear the cost of the publishing of the last advertisement. 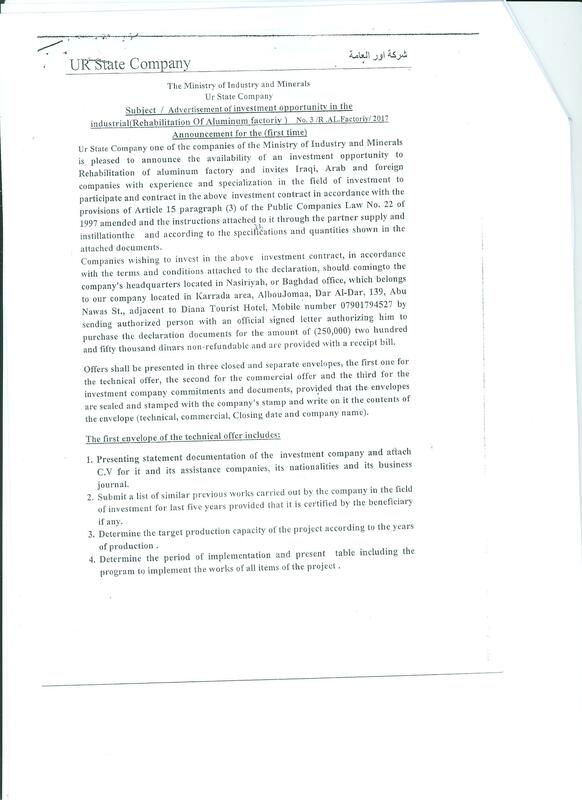 Bids may be sent to our company’s headquarters by an authorized person bearing an authorization letter signed by the managing director of the bidding company. 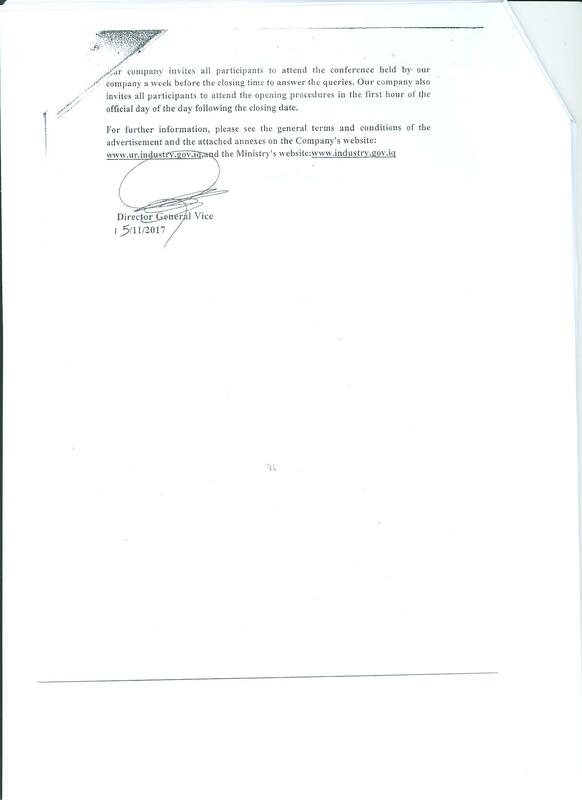 The authorization letter shall be authenticated by the Iraqi Embassy if the company is develop from Arab or foreign company. Bids shall be deposited in the offers box at the company’s headquarters no later than 1:00 pm on the closing day Tuesday, 26.12.2017. The offers shall not be accepted if arrived after the closing date or were sent by email. The Arab and foreign companies that do not have a branch in Iraq can submit the offer by DHL international express mail and must be delivered before the closing date. If the date of the closing day coincides with an official holiday, the next day shall be the date of the closing advertisement. Our company invites all participants to attend the conference held by our company a week before the closing date to answer the queries. Our company also invites all participants to attend the opening procedures in the first hour of the official day following the closing date. 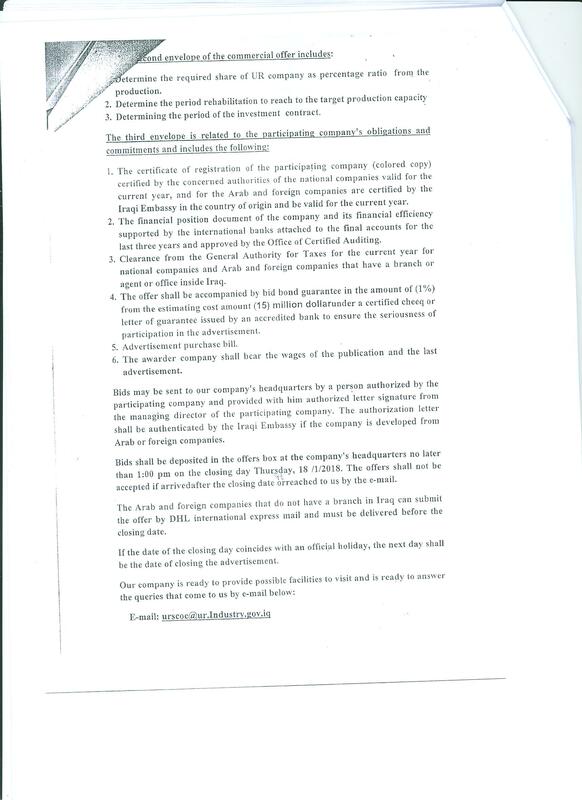 Investors willing to invest in the aforementioned investment opportunities are required to submit a detailed offer with the feasablity study at the headquarter of the National investment Commission or the headquarter of the Crossing Points commission within (30) days from the date of publishing this announcement.